Email Sending Issues? - what is Domain Reputation and how does it effect you? What is Domain and IP Reputation? IP reputation is the rating your ISP (Internet Service Provider) has based on the specific IP address used by your Hosting and/or mail server. Many ISP or Hosting Providers give you an IP address from the "Pool" of Addresses they have purchased, these IP addresses are often used on hosting servers that are shared amongst their users. This is the disadvantage of using "out of the box" or "Off the shelf" hosting providers, as the odds are you are on a shared server with hundreds if not thousands of other websites. as your email address uses the same hosting provider in most cases, it also means that the IP address is also used for your emails, this results in hundreds if not thousands of users sending and receiving emails from the same IP address as you. Currently an estimated 86% of all email traffic is actually spam emails, and many of these come from the very IP address you are using right now to send emails. 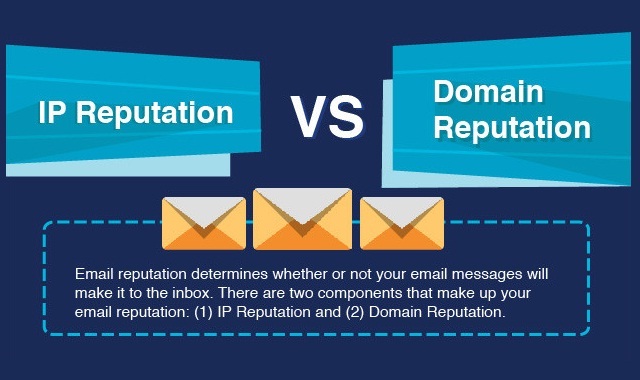 How to check your email reputation? the Reputation Authority is a site were you enter your web address and get an easy to follow report on how your domain stacks up. To SSL or Not to SSL - https what is it and is it worth it? For many years running an e-commerce Shop (Online Store) or any web based service that required a user to purchase or give details like credit card information required the use of an SSL Certificate, this added the green padlock symbol to show on the left of the website address (url) and the addition of the https: within that url on a website. For a long time, general information websites (not participating in online transactions) including business websites had no need to use the https encryption from an SSL Certificate. So what is an SSL (https) Certificate and what does it do? Without getting to technical about it, an SSL Certificate (assuming its set up correctly and the web developer has set the website up correctly) will encrypt the website and all traffic to and from the website is also encrypted. The reason to encrypt the traffic and site in simple terms is to prevent hackers from intercepting your communication with a website (if you are looking at a website, you are communicating with it). As the internet has become bigger, more used and more available, more people are turning to the internet to find things they are looking for, business have also moved to the online world to be found, with conventional methods of marketing nowhere near as effective as they once were, with more users and more advertisers and businesses comes more traffic (traffic being communication between a user and a website/s). With an increase in web traffic we have seen an increase of hackers exploiting websites for various reasons. An SSL Certificate makes it almost impossible for common Hackers to gain unauthorized access to a site. I say almost impossible as even with all the methods of securing a site, someone will always try and find a way in and in these cases the person doing the hacks will be highly skilled and will target sites that have valuable information. In most common hacks to informational websites, the hack is a nuisance type hack, which can cause chaos for the business and inconvenience for a visitor. So from a business point of view if you have a normal informational website that does not have any transactions occurring and your site is only providing visitors with information about your business and services you provide, is having an SSL certificate worth it? In sort Yes and more and more it’s becoming less of a good idea and becoming a necessity from a security as well as a marketing point of view. Marketing, what does an SSL have to do with marketing? In short a little and a lot. As more business employ marketing agencies to increase their businesses visibility and website rank in search engines, the competition to be on page 1 alone is getting higher and higher, the days of a position 1 rank for a new website are fading in some searches, just getting to page 1 is an effort and a challenge. Getting to a page 1 position is becoming an increasing exercise in perfection, while search engines priorities good content it’s the extra little bits that are adding up to be the difference between a top ranking site and a non-ranking site. Mobile responsive (vs Mobile friendly, more on this in another post). Encrypted site is a factor in Googles ranking method??? As of August 2014 Google released information in regards to their plans to make the internet a safer place, with their goal of making the internet a safer place they launched a campaign called "HTTPS everywhere" and initiative to promote all websites to take up an SSL encryption. Alongside this Google also announced its inclusion into their ranking algorithm to include https signals (meaning a site will rank higher if using https over a site only using http) at the time of the post the ranking signal was less than 1% however it was also noted that this will increase in time. As many sites are fighting to get onto or stay on page 1, it is becoming more apparent that even things like an SSL that add up to less than 1% can and will be the difference between ranking or not, aside for the security and visitor trust an SSL could well be the difference between page 1 and page 2. This is a very good example of how vital a good Reputation Management System is, in today’s digital world, Social Media and Review sites, can do a lot of damage to a business’s reputation. In many cases an issue with a business that causes a customer to give a negative review can in some cases be a perceived issue. Whatever the reason if a business has no idea that these reviews have been made, they have no idea of the impact they can have on their reputation, however if a business is aware of these reviews, they have the ability to respond to them effectively. Here is a recent example of a good response to a poor review that occurred in the UK. In many cases it is the response to these reviews that can make the reputation of a business shine.